Read or listen the Amplified Bible app, the best offline study tool for Bible readers. 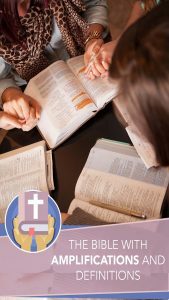 Download a complete Bible translation that uses amplifications, synonyms, definitions and key words for a better understanding of the Scriptures. This easy-to-use app will make the Bible more accessible to you than you ever thought possible. – Portable and easy to use! Take the word of God go with you everywhere. The Scriptures are the truth; the God’s Word is useful and helpful. Choose verses and passages and apply them to your life. The Old Testament is composed of 39 books: Genesis, Exodus, Leviticus, Numbers, Deuteronomy, Joshua, Judges, Ruth, 1 Samuel, 2 Samuel, 1 Kings, 2 Kings, 1 Chronicles, 2 Chronicles, Ezra, Nehemiah, Esther, Job, Psalms, Proverbs, Ecclesiastes, Song of Solomon, Isaiah, Jeremiah, Lamentations, Ezekiel, Daniel, Hosea, Joel, Amos, Obadiah, Jonah, Micah, Nahum, Habakkuk, Zephaniah, Haggai, Zechariah, Malachi. The New Testament is composed of 27 books: Matthew, Mark, Luke, John, Acts, Romans, Corinthians 1 and 2, Galatians, Ephesians, Philippians, Colossians, 1 Thessalonians, 2 Thessalonians, 1 Timothy, 2 Timothy, Titus, Philemon, Hebrews, James, 1 Peter, 2 Peter, 1 John, 2 John, 3 John, Jude, Revelation.